The Malaysian Rubber Glove Manufacturers Association (MARGMA) was established on 28 June 1989 to represent the rubber glove manufacturers and supporting industries associated with the rubber glove manufacturing industry in Malaysia. MARGMA Ordinary Members comprise of bona fide rubber glove manufacturers based in Malaysia. MARGMA Associate Members comprise of local and foreign companies associated with the rubber glove industry. Since its inception, MARGMA has been the official voice and active advocate for the rubber glove industry in Malaysia. MARGMA provides a common platform for discussion and exchange of views aimed at furthering the commercial objectives of its members and promoting a solid trade fraternity amongst them. MARGMA collaborates closely with key Malaysian government agencies and related ASEAN trade associations to promote and protect the interests of its members and the industry. MARGMA also assists its members in addressing domestic and international issues related to their businesses and the industry. MARGMA is administered by a panel of elected Management Committee with the support of a strong Secretariat in its day-to-day operations. With the outstanding success of the 9th International Rubber Glove Conference and Exhibition (IRGCE) in 2018, MARGMA has continued to reaffirm the status of its flagship event as the “World’s Largest Rubber Glove Event”. With the 10th edition of the IRGCE set to return bigger and better from 8 – 10 September 2020, this show is definitely a must-attend affair for all, be it the Rubber Glove Industry or its supporting industries. 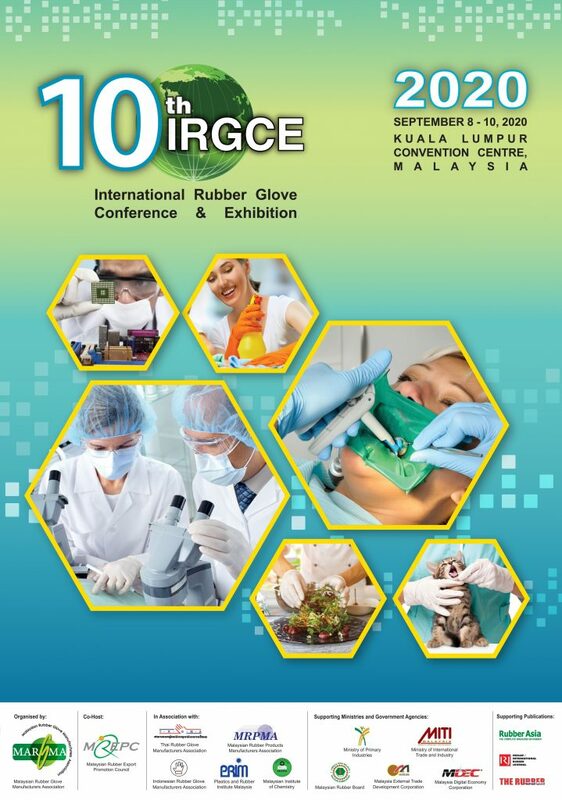 With the aim of bridging the gap among industry players and fortifying a greater exchange of ideas the International Rubber Glove Conference and Exhibition (IRGCE) was inaugurated in 2002 and has continued to build momentum biennially, alongside the industry, to be recognized as the premier platform for all relevant parties to come together and work hand in glove. The 10th IRGCE 2020 is organized by MARGMA and co-hosted by the Malaysian Export Promotion Council (MREPC), in association with the Thai Rubber Glove Manufacturers Association (TRGMA) and the Indonesian Rubber Glove Manufacturers Association (IRGMA). The event is supported by the Ministry of Primary Industries (MPI), Ministry of International Trade and Industry (MITI), Malaysian Rubber Board (MRB), Malaysia External Trade Development Corporation (MATRADE) and Malaysia Digital Economy Corporation (MDEC). For further information on this event, download the 10th IRGCE 2020 Brochure. The IRGCE would not be complete without its trademark conference which looks to feature the very latest innovations and developments and trends within the rubber, rubber glove and medical devices industries. After two decades, the IRGCE Conference continues to thrive as the principal platform for industry opinion leaders and professionals to discuss topics of common interest. As the 10th IRGCE 2020 is set once again to push the boundaries and outdo itself, there will not be a lack of accredited papers being featured and presented by various internationally renowned speakers on the trendsetting topics of today and tomorrow. ENTRANCE TO THE EXHIBITION HALLS IS FREE. As of 19 March 2019, 130 companies from 14 countries have confirmed their participation in the exhibition. Visitors can expect an exciting showcase of the latest product innovations and technologies not only from the Rubber Glove Manufacturers but the wide array of supporting industries as well. The exhibition is the perfect place to discover everything en-vogue for rubber gloves while potentially discovering avenues which would help you stay ahead of the competition. If you would like to take up booths in the exhibition, kindly contact Ms. Cindy Lee (cindy@margma.com.my) for further information. The following are more details of the exhibitors.